I am generally leery of books where the author posits a provocative wide-ranging thesis. Its probably largely Malcolm Gladwell's fault. So naturally I approached Anita Elberse's Blockbusters with some trepidation. She makes the claim that focusing on high-stakes major campaigns is essential to succeeding in today's entertainment industry and she employs a plethora of examples and research from movies, sports, books, music, and television to support her case. While it can be a bit dry at times, Blockbusters is a very informative and often fascinating examination of the current and future state of the entertainment industry and the increasing importance of tentpole products and campaigns. Elberse is a professor at the Harvard Business School who understandably brings a wealth of knowledge regarding the industry. She also has experience researching topics such as the economic effects of the unbundling of songs from albums on the music industry (bad for record labels). Elberse has built up quite an impressive list of contacts (she actually just co-wrote an article with Sir Alex Ferguson), which greatly enriches the book. Blockbusters is able to glean insights from major players such as Maria Sharapova's agent and Alan Horn, the former president of Warner Bros. Rather than speculating on the strategies behind campaigns, Elberse is able to pick the brains of decision makers. The book's main concept is an intriguing and seemingly counter-intuitive approach to entertainment. Essentially, the strategy of hedging bets with a diverse portfolio of products is not the path to profitability for entertainment entities. They should instead promote a few projects and bet big on their success. Elberse illustrates this point with a huge amount of well-argued statements backed up by data and examples, often with commentary from major players. Her book is wide in scope and ranges from Youtube to major opera houses and Argentinian soccer, yet she manages to explore all subjects in considerable depth. 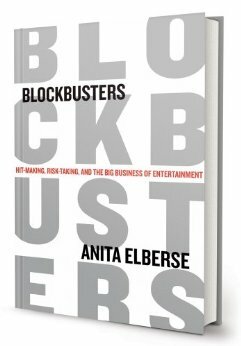 She is also refreshingly objective, acknowledging the drawbacks and inherent risks of the blockbuster strategy and why smaller-scale projects are still valuable (largely to facilitate the continued success of blockbusters). She explains the impact of blockbusters on producers and stars, and her chapters on endorsement deals are especially enlightening. I really enjoyed learning about the rationale behind athletic sponsorships for star athletes, such as when Elberse describes how Lebron James weighed three endorsement deals with different compensation models and King James' thought process behind his decision. And as would probably be expected by a new book, Blockbusters explores how recent technological innovations such as original content on Netflix and YouTube and speculates how they will impact the blockbuster model in the future. Despite the author's academic background, her book is largely readable and suitable for mainstream audiences. Her target audience seems to be the kinds of people who are at least slightly interested in following entertainment trends in places like the Wall Street Journal and Economist. Some basic business knowledge would be nice to get the most out of Blockbusters but there are no complicated formulas or anything and she explains everything in a clear fashion that a layman can understand. She is more concerned with communicating the conclusions resulting from her complicated statistical analyses rather than how she derived them. While the epilogue looks at ways to apply her blockbuster thesis to other fields, this is (mercifully) not the kind of book with workshops every chapter detailing how to apply these lessons to your job. The book is meant to inform and entertain, and it largely succeeds on both counts. At times Blockbusters reads like a case study, which is fine as far as imparting information goes but it doesn't always make for the most captivating reading material. Sometimes the book drags as she explains the nitty-gritty of particular financial details, but it is generally readable and many of the book's conclusions are fascinating. She is able to pack a ton of information and insight into the book and it improved my understanding of the entertainment business more than any other book. Anyone interested in learning about the current state of the entertainment industry and how it is being affected by technological innovations will get a lot out of Blockbusters. Elberse is able to combine the expertise of an academic with the clarity and eloquence of a journalist. She definitely subscribes to a higher burden of proof than many other books based on supporting a major thesis but even if you remain unconvinced about the blockbuster strategy you can still derive quite a bit of enjoyment and knowledge out of the book. Blockbusters ultimately maintained my interest through most of its pages and is worth seeking out for those interested in the topic. Full Disclosure: I received a free copy of the book as part of a LibraryThing.com giveaway. There is a good amount of well-written football books. There are also many football books penned by current and former players. Unfortunately, there has generally been little overlap between the two. NFL memoirs are often cash-outs after particularly improbable seasons or impending bankruptcy or financially-ruinous divorces. The player's voice is generally diluted by a co-author who invariably has a penchant for lame cliches and generic athlete platitudes. Thankfully, Slow Getting Up, Nate Jackson's reflections on his eight years on the fringes of the NFL, features quality prose and brings a fresh and insightful perspective to a rather stale format. It is one of the most entertaining football books released in the past few years and is a worthwhile read for football fans interested in learning more about the trials and tribulations facing professional football players. After beginning with a 2008 hamstring injury that ultimately spelled the end of Jackson's career (physical maladies and the arduous rehabilitation associated with them will be a common theme throughout the piece) Slow Getting Up chronicles Jackson's improbable journey from Division III star at Menlo College to making an NFL roster and sticking around and contributing in the league for several years. Each chapter generally covers a season and the book moves at a fast clip and reads like a series of fleshed-out blog posts. He devotes early passages to outlining the draft process and his attempts to stick with the San Francisco 49ers as an undrafted free agent. Jackson is eventually traded to the Broncos during training camp in 2003 and he initially manages to stick on the practice squad before spending a few years as a backup tight end and special teamer with Denver. The author's relatively long tenure allows him to mine a considerable amount of anecdotal gems from his playing career, such as playing for the Rhein Fire in NFL Europe, losing to the Steelers in the 2005 AFC Championship Game, enduring a surreal training camp with Eric Mangini's Cleveland Browns in 2009, and trying to catch on with the cash-strapped Las Vegas Locomotives of the UFL. Slow Getting Up is one of the few player memoirs to really focus on an athlete treading the tenuous line between the practice squad and special teams and a career outside of the NFL. Understandably, most publishers are not really enamored with putting out books by authors with only 2 more NFL touchdowns than their general audience. Because Jackson is not able to describe what it feels like to catch a game winning touchdown in the Super Bowl or catch 100 passes in a season, much of Slow Getting Up touches upon activities outside the games. Jackson details life on an average NFL road trip, playing on the scout team, the incredibly frustrating process of rehabilitating from injuries, and extravagant nights of clubbing. That being said, Jackson does go into some depth about the game when he discusses his larger roles on special teams, where he played on kickoff, kick off return, and punt units for the Broncos. Some of his gridiron observations are also insightful, such as how coaches like Gary Kubiak, who spent his entire career as John Elway's backup, is more concerned with concepts than those with more NFL game experience. I feel that football players are generally held to lower standards as writers (which makes sense given many of them are pretty poor in the literary department) but Jackson's prose is legitimately enjoyable to read compared to any writer. His writing is peppered with pop culture references and witty turns of phrase. Sometimes his humor can come off as sophomoric and overly scatological, but Slow Getting Up is mostly a pleasure to read. His tone is sarcastic, self-deprecating, and irreverent and it is refreshing to hear a former player be so candid. Jackson even admits to a brief fling with HGH while attempting to recover from an injury. It is hard to think of a better guide (among former NFL players) through Mangini's surreal militaristic training camp, where players watch film cutups of warmups in meetings and are constantly quizzed on team mantras, than the snarky and incredulous Jackson. Jackson also is able to vividly describe much of his NFL life. This is probably due to the fact that he has essentially been writing this work for several years. Jackson started a journal for the Broncos' website when he played for the Rhein Fire in 2004 and maintained his column for three years. Additionally, Jackson was able to consult with Wall Street Journal writer Stefan Fatsis while the latter attended Broncos' training camp to write A Few Seconds of Panic (a 2000s version of Paper Lion that is worth seeking out for football fans or anyone curious as to the depths of Todd Sauerbrun's craziness). There is a surprising amount of dialogue in Slow Getting Up and while I am guessing most/all of it is based on Jackson's recollections it still demonstrates the robustness of his memories. Jackson also is not bitter about much and does not really have a bone to pick with anyone and he is generally objective and fair-minded. There are no chapters lamenting the physical beatings he endured, rants against the teams that released him, or chastising agents or fans that wronged him. Some may find his portrayals of Adam Schefter (who used to beat a beat writer for the Broncos) and Eric Mangini a bit unfair but who is honestly going to defend those guys? Jackson's riffs on their insufferable personalities were some of the highlights of the book for me. Most NFL memoirs devote at least some pages to describing players' general weekly routines during training camp and the regular season. What separates Slow Getting Up from the pack is Jackson's perspective and insight into such matters. I understand the comparisons to Ball Four, but Slow Getting Up really struck me as the football cousin of Mark Titus' Don't Put Me in Coach. Both books seem geared towards the Grantland-reading demographic who will catch the Radiohead references and appreciate the anecdotes about players and coaches from years past. 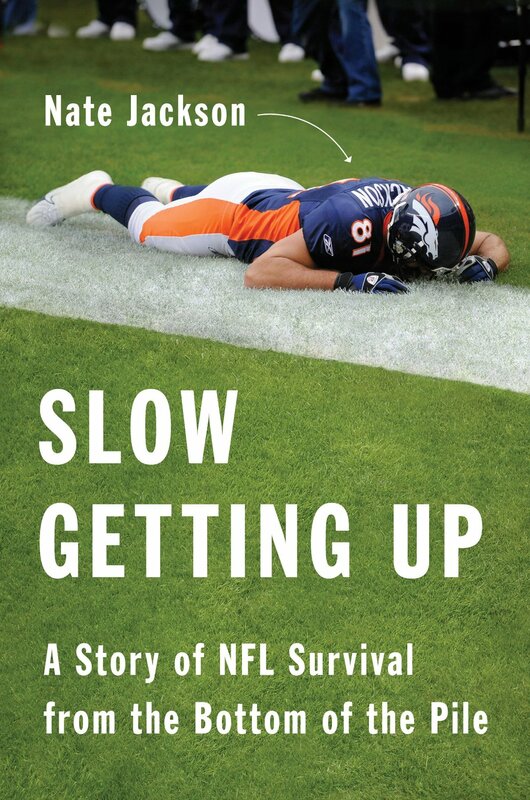 I don't think it will be added to the literary pantheon of the best football books ever (not that Jackson ever intended that) but Slow Getting Up is a fast-paced, entertaining and enlightening look at life in the NFL that I thoroughly enjoyed.